My previous post shows the beaded necklace from my workshop with Beverly Ash-Gilbert. This is another pendant from the first workshop she presented that weekend. It is two pieces of copper sheet metal riveted together and then embellished with one of her bead soups. I finished it off by painting liver of sulfur on the background shape. I had beaded the piece before I could patina it, and not wanting to dip the entire piece in a noxious solution, I simply dipped the brush in and painted. It took a bunch of dipping and brushing but I am so pleased at how that worked. I used a simple rubber cord to hang it on. 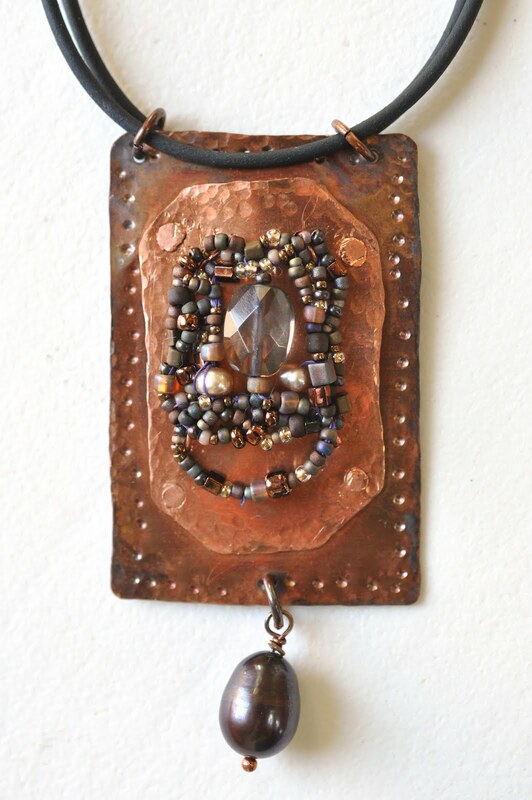 I love seeing your jewelry ~ such a beautiful mixture of design/elements. This is spectacular! What an interesting technique you've learned. I can't wait to see more!